Thanks to her sneak-thieving skills, Hush Cantrell can fend for herself. Which is a good thing, since her mom's the last person to look out for her. Hush's life isn't all roses, but when her new friend Desiree enters the picture, things start looking up. That is, until Hush's luck runs out and she's finally caught. Now Hush has to turn over a new leaf: her only alternative to the dreaded "juvvie" is a job at Miz Tromp's Nursery. There Hush gets more than she bargained for--she learns for the first time how to make good things grow. But soon Hush realizes something strange is happening to her: she can actually see people's pain--and take it away. Pretty soon Hush and Desiree are on a mission to rid their town of pain. What could possibly be the downside to that? 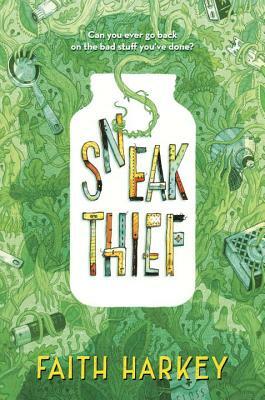 With an appealing southern voice and a hint of magical realism, Sneak Thief is a funny and life-affirming story of one girl lost--and found. Faith Harkey finds her inspiration on the back roads of America. From small towns in the heartland to footpaths deep in the mountains, she is drawn to places that remind us we are all together part of something larger. When she isn't on the road in search of a story, she recharges her batteries in Tallahassee, Florida. Faith is also the author of Genuine Sweet. Find out more at FaithHarkey.com.